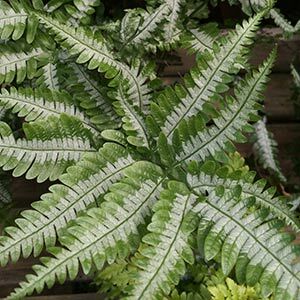 If you are looking for colorful foliage in a fern then Pteris argyraea commonly called the Silver Brake Fern could well be worth a look. 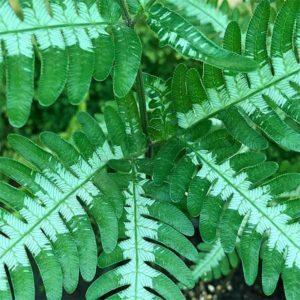 This is a very decorative fern and with broad silvery white bands the foliage adds a touch of brightness to dark areas of the garden. Good mid green foliage the silvery variegation running up the centre of each frond, and to top it off a central vein of green. A striking vibrant fern that adds colour to the fernery or garden. This is a reasonably large growing fern reaching up to 1m in height in good conditions. It will spread to form a good clump up to .5m across before needing dividing. Excellent in a fernery, Bush House or in a shaded position in the garden. Suited to planting as border plant next to pathway in deepish shade with moist soil. Although this is large growing fern, it makes an excellent indoor plant that will grow well in containers. Common Name – Silver Brake Fern. Foliage – Long fronds to 1 metre. Variegated green and silver.